Asteroids for the Atari 2600 is a real classic. 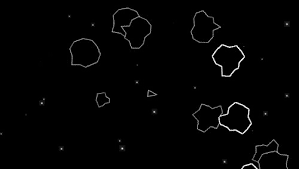 The main objective of the game is to destroy the asteroids and don't crash into them, thus the name Asteroids. Now, this is harder than it sounds, mostly due to the difficult flying controls, but it is fun never the less. There are some abilities that will help you out, but it can also ruin your game too, in which I say it's a perfect balance that way it's not too overpowered. So far, the only abilities I found were teleportation and shield. The teleportation ability lets you teleport from any on coming asteroids, but at a price. That is you can't control where you end up at, so it could be anywhere, even in the path of another asteroid. The shield protects you from an asteroid, but only small ones, and you can only hold it for so long before you go boom. Now, I live in a family that plays a lot of old school games, especially my parents, so multiplayer will probably be a want in here. Well, this game supports two players instead the four, and you have to be patient and take turns with two controllers. Now, this is not advanced, but is actually quite livable and it's possible to stay calm and patient while the other player takes his turn. The competition here is to get the most points out of the two of you, or the longest survival time. This doesn't seem exciting, but hey, it was made back then before most of us were born. Overall, Asteroids is a great game. Sure, it might not have things that we have today, but remember, this was made in 1979, not 2014, ok?